CW Brabender Instruments is a leading global provider and manufacturer specializing in various lab, analytical, processing equipment and more. For over 88 years, Brabender has been providing a comprehensive line of high quality equipment that primarily sources the food and other related industries. Brabender focuses on continuous innovation and advancements to ensure the ideal equipment solutions for a number of needs. 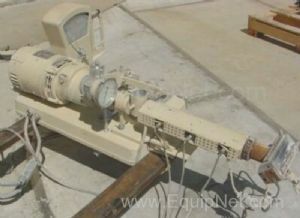 EquipNet is constantly receiving used Brabender Instruments equipment through our exclusive contracts with our clients. Our inventory of used Brabender equipment includes Single Screw Extruders and more. If you do not see the used Brabender Instruments equipment you are looking for, call one of our representatives and we'll find it for you. We can also source the right tooling and change parts that you need through our huge network of corporate clients from around the globe. CW Brabender Instruments manufactures a number of extruders, including various single screw extruder models and twin screw extruder models. Brabender extruders are designed to meet strict industry standards and provide optimum performance. EquipNet carries a range of used Brabender equipment including used Brabender extruders, such as the EX-250 Plastic Extruder and more.